The Ichimoku cloud is the most noticeable piece of indicator in the Ichimoku chart. The idea behind the ichimoku cloud is that it is the resistance that we should be most aware of. It also tells us where the bias of the trend is and where it is heading. 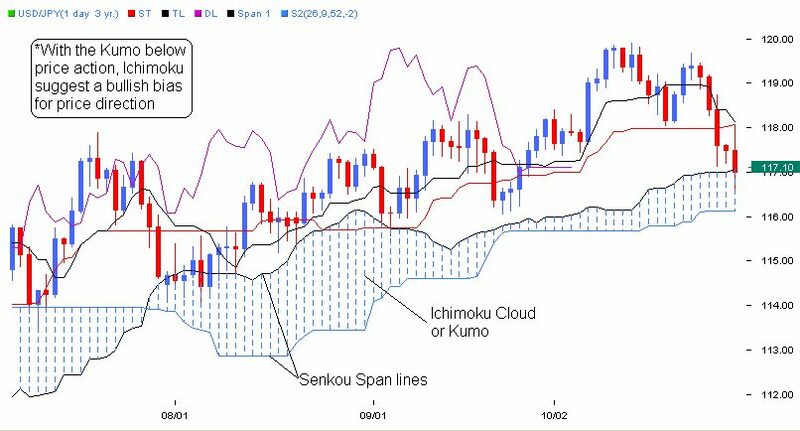 Ichimoku clouds are formed because of the senkou span lines A and B. When A is above B, it is bullish. When B is above A, it is bearish. Think of the ichimoku cloud as resistance lines. Only that they are lines with big bodies that vary at different points in time. The larger the body, the greater the resistance. The thinner is the cloud, the easier it is for the price action to break it because it represents a weaker resistance. On our last post about the 3 lines of ichimoku, we said that the kijun lines is the heavy weight when it comes to the resistance. But the last resistance that the price must break is the cloud. If it wishes to reverse. In other words, the ichimoku cloud is the last resistance for a confirmation of a reversal. It it didn’t bounce back to the normal trend after hitting the cloud, then its probably going to reverse. A cloud with a flat line is a strong resistance. The flat line is the resistance line. The ichimoku cloud or kumo has this idea of “future”. Consider this image. Look at the last price action. The kumo cloud just below the last price action (yellow cloud) represents the latest price action. But looking a further to the right, there is a green cloud that looks somewhat incomplete. That is the future kumo or future cloud. It tries to predict what the next bias will be and will also try to give you a signal if there is a strong resistance is forming. The future cloud is very important in giving us the first sign of reversal. I also look at the future cloud for the same reason and to be aware of strong resistance cloud forming. When the cloud changes in color, you are the first to know if the trend is weakening and you can decide on this information. There’s a lot to take in, when you combine all the lines and the cloud altogether. And this is a good thing. Because the beauty of ichimoku indicator is that, because there are a lot of indicators for it, the lines and the kumo, you can craft a trading strategy that fits only for you. Without deviating from the core that makes it successful. On the next post, I’ll teach you how you can combine all these indicators to create a trading strategy. And I will teach you the core trading strategy of this indicator that makes it successful. Hi There! This is a very nice post indeed! Because of this I was able to generate my own trading system using Ichimoku indicator. Looking forward to your other future posts!